You need not be a master to do Reiki on yourself. Reiki is an ancient Japanese healing treatment that uses the life force energy flowing around us. Reiki treatments have become a popular alternative when traditional medical treatments fail or as a healing therapy supplement. Increasingly, more and more hospitals across the national are offering Reiki treatments given by certified Reiki masters who hold Reiki healing sessions. In a usual session, the Reiki practitioner focuses the “ki” energy onto various parts of the patients body, channeling heat and energy where it is most needed. While it is common to see one person performing Reiki on another, it is actually possible to give Reiki treatment even when two people are not physically close together. This is known as Reiki distance healing. Another unique part of Reiki is that it is also perfectly natural to do Reiki on yourself. Healing yourself through Reiki gives you the same benefits as attending a healing session with the added benefit of convenience. You don’t have to leave your house to receive treatment and you don’t need to pay a certified Reiki healer to treat you. You can do Reiki on yourself as often as you need rather than wait for openings in a busy master’s schedule. As long as you have basic Reiki training by attending a workshop, class, or even by reading a book, then you are fully equipped to use Reiki on yourself. Doing so will give you a number of great benefits including healing troubled areas, preventing disease, and empowering yourself even further to mold more “ki,” the invisible energy field upon which Reiki is based. Being able to perform Reiki need only require an open mind, receptiveness to the healing force, and a quiet area where you can be alone and undisturbed. You need not even have completed any Reiki levels of training though at Level I you will certainly be more comfortable and capable of doing this. As long as your are aware, receptive, and attuned to Reiki energy, you will be able to perfrom these steps to do Reiki on yourself. Lie down on a bed or on the floor with a yoga mat. Start by practicing breathing exercises. Close your eyes and take deep breaths, being sure to inhale and exhale by expanding your belly. Imagine your “ki” being gathered and molded in your belly. Cover your thumbs with the tips of your index fingers. Keep your fingers connected to complete circulation. Stay in this position for a few minutes. Move your hands to the sides of your head and cover your temples with your palms resting on your cheekbones. Stay in this position for a few minutes. Move your hands to the front of your face and cover your eyes with your palms resting on your cheekbones. Stay in this position for a few minutes. Move your hands to the sides of your throat and cover the left and right sides of your neck. Stay in this position for a few minutes. 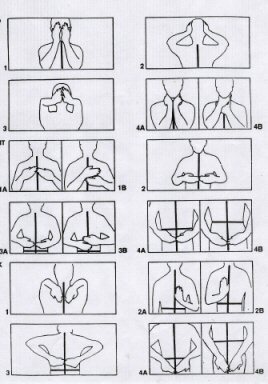 Move your hands to your chest and cover each breast. Stay in this position for a few minutes. Move your hands over your belly and cover each side. Stay in this position for a few minutes. Move your hands over your waist and cover each hipbone. Stay in this position for a few minutes. Move your hands over your lower abdominal muscles and keep your hands pointed downward. Stay in this position for a few minutes. While focusing on breathing and channeling energy the entire time, rest your hands to your sides and relax. You may feel your hands tingle while your are performing this healing session on yourself. This is normal. You should also feel heat in the areas of your body where your hands are focusing healing energy. By focusing on each area, you are releasing the different chakra spots on your body. This entry was posted on Monday, July 11th, 2011 at 5:44 pm and is filed under Healing Sessions. Follow the comments through the RSS 2.0 feed. You can post a comment. Trackbacking is not allowed. Diana..OMG I have been using this method on my self for over a year..due to health issues, where I lost the ability to walk. I’ve heard of Reiki but haven’t tried it yet. Very interesting… You have a great website here! Thanks for stopping by my blog! I’ll have to come back and read some more about Reiki!